About a week ago Vladimir sent me his watch in order for me to review it and find more information on this rare bird. I can say that I was intrigued with a few aspects of this watch so I decided to dig into this and find some answer. 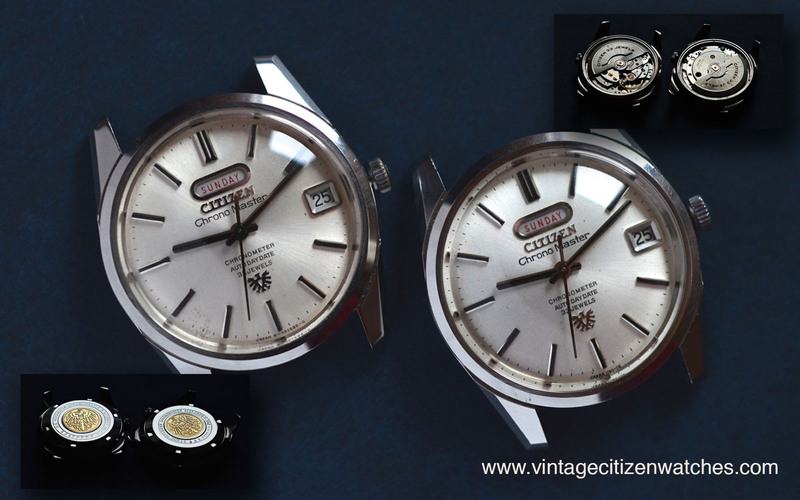 Well guys, here it is the July 1968 Parawater Citizen Crystate Deluxe 22 Jewels! The entire watch is made of stainless steel and so is the bracelet. The 37mm case is entirely polished with simple and elegant surfaces. By contrast the bracelet finishing alternates between brushed and polished parts. Even though there is no brushed surface on the case, there is something similar, on the dial! Well, about the dial, that is a piece of art, simple, silver, with longitudinal brushed texture from 12 to 6, with applied hour markers. By the way, there is no date feature so the dial is well balanced. Regarding the polished hour markers, they also have a longitudinal black line except for the 12 o’clock one that has two. There is no luminous material to be found. The hands match the overall design and are simple, with a centrally mounted sweeping hand that hacks when the time is set (we will talk a little about the movement later). On the dial we can find the Citizen logo and a the star logo applied. The “Crystate Deluxe” and “22 jewels” are printed in black. The dial code and “Japan”, as well as the minute chapter ring, are also printed in black. I found a black dial version of the watch online and it seams it came in only two dial variants, silver and black. I like the silver one better. The crystal is made of mineral glass and this fact on top of the upgraded metal bracelet gave the base model (the Citizen Homer) a new life into the form of the Crystate. It also has SS case, better regulated movement and screw in case back. The Deluxe and the star logo suggest a better finished movement. (thank you Kenneth for your help!) This one has 22 jewels because there is one additional one in addition of the regular 21, on the underneath part of the barrel. The movement is rather common one (except for the additional jewel and better finishing) and hand winds. It also hacks for a better time setting. It runs at 18,000 bph. Thank you Vladimir for lending me your watch, I took good care of it and I hope you enjoyed the review! 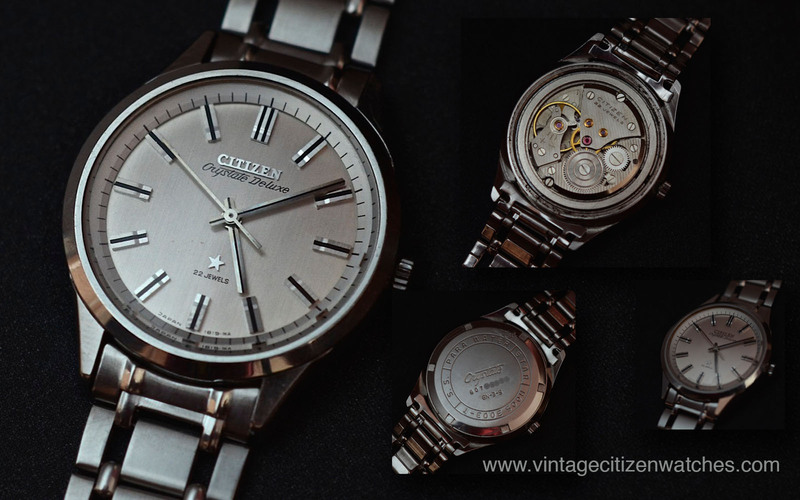 Read more about other simple Citizen watches HERE. 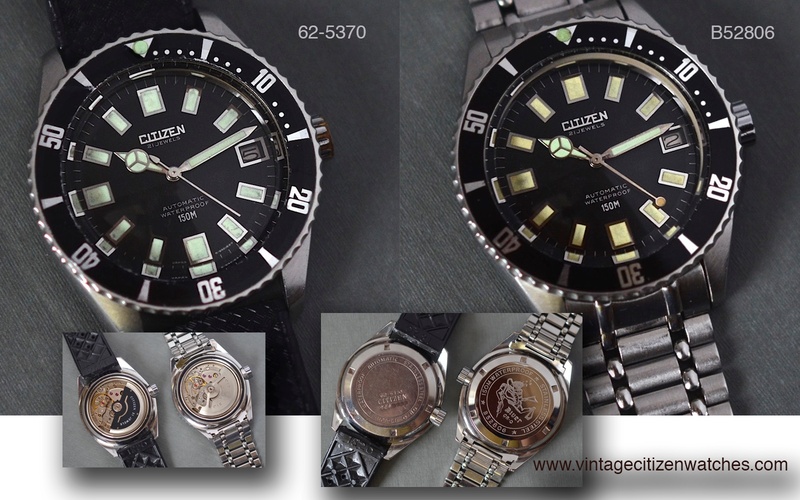 Citizen launched this interesting range in 1970 and also in 1970 they started experimenting black coating their watches. 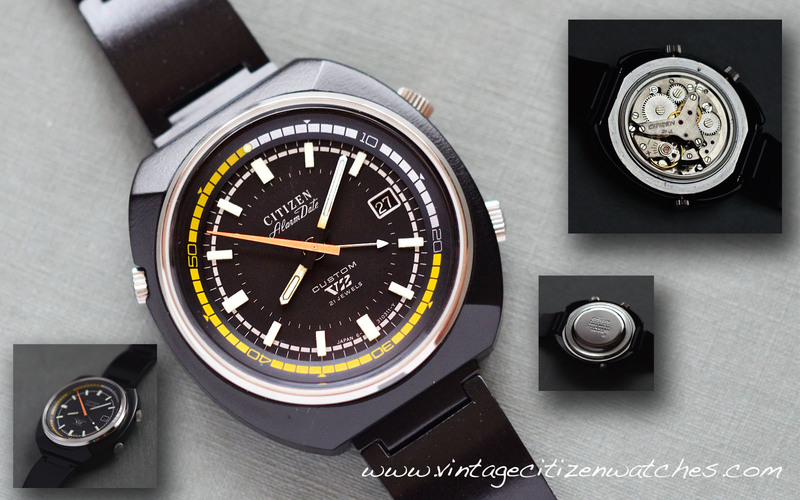 One of the interesting facts about this particular watch is the fact that is made in May 1970, being one of the first Blackies Citizen ever built. The case, as well as the bracelet, is black coated aluminum alloy. The clasp is made of stainless steel and the folding part in not coated. The outer part of the clasp is coated too so the look of the entire watch is as black as it gets. Even the screw in case-back is black. The bezel is black, the dial and the crown, black too. The date and the day wheels are, you guessed it, black. 🙂 No wonder Citizen named this “Blackie”. 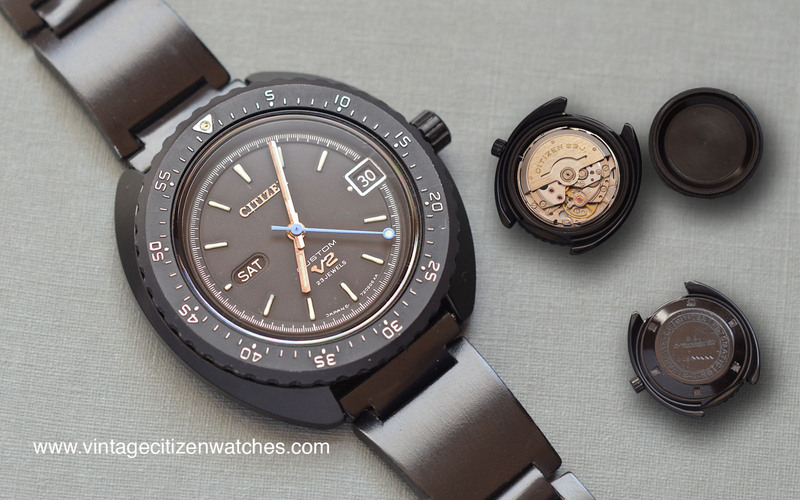 The reason for coating their watches for Citizen was the same reason manufacturers are doing it today: it looks good and they try to find ways to protect the material underneath. Because this watch is made of a very light alloy, that is not really scratch resistant, the coating comes as a great addition. The entire lettering is printed white, the numerals on the bidirectional rotating bezel are raised, and so are the luminous hour markers on the dial. The Citizen logo and the V2 one are applied and polished. The hands are polished too except for the blue central second hand that has a luminous dot. Sundays are printed in red, while all the rest is white. Later versions of this watch have the day wheel white with black lettering and non coated case backs. The movement inside is the Citizen automatic calibre 7280, 23 Jewels, running at 21,600 bph. It hacks (when setting the time the second hand stops). It is an automatic movement, but as most Citizen calibres, this one hand winds too. The date is a quick set (in the second crown position) and the day changes by advancing the hour hand past midnight. Bottom line, this is a beautiful, interesting, lovely to wear and look at… BLACK marvel. 🙂 It somehow reminds me of the white chalk writing on the school table. Awesome watch!